The alley beneath my window connected Brownell Street to an interior asphalt courtyard of tenements and the back of the Terminal Bakery. Mr. Jeff, who lived in the house next door, was a meticulous man. His trash cans, shiny and with “135” painted in two graceful arcs on each side of the handles, sat beyond reproach at the back of the alley. 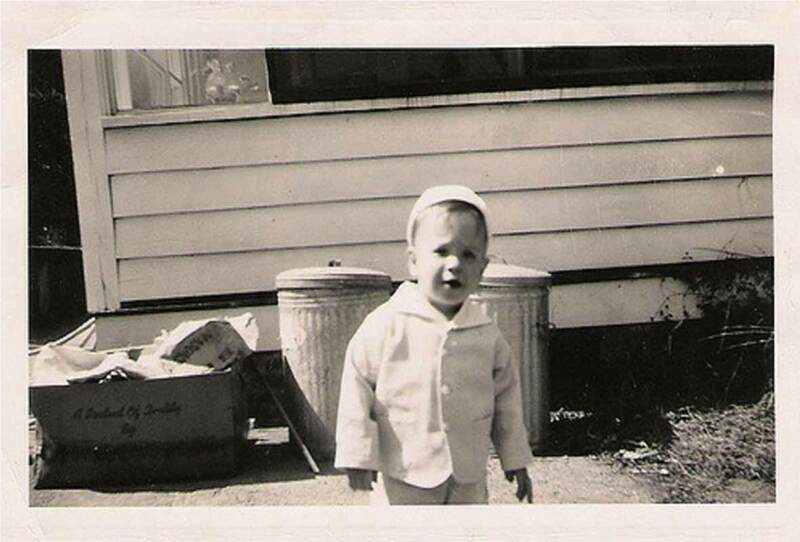 One summer morning, after being shrugged off by our mothers and told to “go play in traffic,” Gail, my neighbor from across the street, and I headed for the alley to play supermarket. Mr. Jeff, besides his incredible orderliness, was blessed with uncanny hearing, so we had to be cat-burglar quiet. I lifted the trash-can lid and placed it on the ground. Gail and I then began picking through the garbage for our quarry: food containers in mint condition. “I found one!” I whispered, pulling out an empty milk carton. Gail began rummaging in earnest, determined to get her share. When she plucked out a frozen dinner box, jealousy seized me. Deeper and deeper into the can we leaned, tipping it down until we’d ravaged its contents. And there at the bottom was the gem. I nabbed it before Gail could. She was so in awe of it, she didn’t even attempt to fight. I held it out and we just beamed. “It’s not ‘luh soo-uh,’” I said, deeply offended. “’Cuz Dina’s French, and she pronounces it ‘ler sewer,’” I said, covering the garbage can and placing the opened can of Le Sueur peas on top. I became a lifelong Francophile because of Dina. My mother would pick up brochures from the local travel agency, for some trip she’d never take with my father, I guess, and when she was done, she’d let me play with them. I’d sit on Dina’s lap in her rocking chair as we looked at all the pictures of France. It wasn’t until I was in seventh grade and wanted to practice my French lessons with her that I learned that she not only didn’t know a word of la langue Française, she wasn’t even French. Dina was Portuguese and French-Canadian. Her family was from the South End of Fall River—the very wrong end, my mother would say. But back then, before I knew any of this, I adored her because she shunned anything Portuguese. French people, French style, French food were superior. 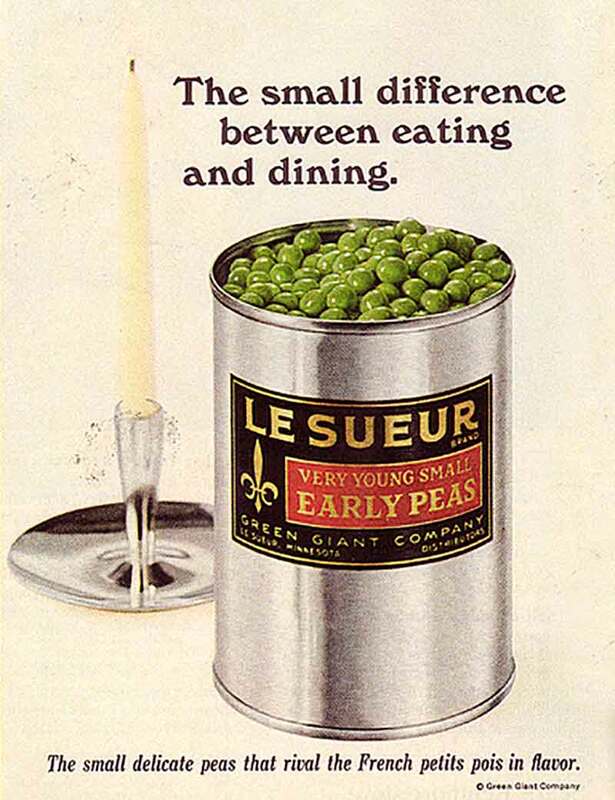 Once Gail and I had our inventory, we went to work lining up the items against the foundation of Mr. Jeff’s house by sections: dairy, frozen foods, packaged foods, and finally our Holy Grail, canned goods, with the Le Sueur peas at the end. It was a paean to the American packaged foods of the early ’60s that I wasn’t allowed to eat. With our supermarket now opened, Gail and I would shop, making idle husband-and-wife chatter down the aisle. I’d never been in Mr. Jeff’s house, but if his garbage was any indication, he was a man of varied and exotic tastes. I’d never seen any of his colorfully packaged foods in our kitchen. Instead of moping in front of plates of blood sausage, purple octopus stew, or whole fish with hundreds of bones, I imagined myself at the table with my parents, me in a jacket and tie, because I was convinced that’s how French children dressed for dinner. In front of me would be one of Mr. Jeff’s TV dinner—out of its tray, because separating your food into sections was for babies. Or for old sick people in the hospital. Instead, the meatloaf, mashed potatoes, and carrots would be artfully arranged on the plate by our cook, who slept on the tub-less bathroom floor because, well, she was a servant, and the spare bedroom was reserved not for our most recent hollowed-eyed relative from the Old Country but rather for visiting dignitaries from Europe, who brought me chocolate and cheese balls from their countries, hoping to curry favor with the local government. Being Fall River’s biggest child TV star, I would deign to act as a cultural attaché. “Get the hell out of there!” Mr. Jeff was rapping on his window. Then his screen door slapped shut. Gail and I fled, she back home, me to the Terminal Bakery. As I turned the corner of the alley leading down the steps to the bakery, I looked back. Mr. Jeff was bent over, muttering to himself as he kicked down our carefully arranged supermarket, and I cried. Photo © 2010 Liquesence. All rights reserved. All recipes and photos used with permission of the publisher. Love this, though. Thanks for sharing. More David writing is always better! Thank you, Beth. I have a few other “lost episodes” from the coming up soon. Exactly, April. This was really hard to cut, as it’s so evocative and universal, in a sense. But the ideas conveyed here were conveyed better in the book. When I was growing up, we never played store, but we played school a lot. Guess I was practicing for my future career as a teacher. We didn’t have any mean neighbors, but that might be because my dad was 6’5″ & would’ve stomped anyone who messed with his kids. Ha! We never played school, Dottie, but store, yes. And it was always my store. And I always made a profit…. Hmmmm. I found it interesting that your experience lead you to the food industry just as your other reader was lead to teaching from her childhood games. I had a Howdy Doody general store and ended up with clothing stores. We were a generation that found work to be fun. Do what you love and the money will come. Great Memory! As one of seven kids…we always played house…I was the cook! We played supermarket along with playing house…and we played school. My memory of playing house that is always front and center…My Mother was making spaghetti sauce one day and the ends of the onions and celery were in the sink, I cut around the ‘blossom’ end of the onions, and shaved the brown off the celery, and I stole some sauce from the pan and went outside to my ‘kitchen’…mixed the onions, celery and sauce and served it on little plates to my brothers and sisters! Just made us more hungry for dinner that night! Cheryl, what a delightful story! Did your brothers and sisters eat your creation?! Love your story! Brings back childhood memories of my own. We always played store. We gathered ‘weeds’ like dandelions, buttercups,dock, thistles etc., and laid them out in bundles like different vegetables… happy childhood memories of long sunny summer evenings. True, Susan. These memories have stayed with me for half a century. They’re sharp and vivid as if it were yesterday. Loved your recollection!! My little Book Club just finished Notes on a Banana and our meeting is this Wednesday. Per usual, we are having dinner themed to the book chosen…so it will be all things Portuguese. I even now have your cookbook and am looking forward to trying lots of the recipes. Thanks for sharing…. Ann-Marie Kelly. Thank you! What time on Wednesday is your group meeting? I’d be happy to Skype in so that members can ask me questions, if the timing works. David, I believe we were neighbors, Corner N. Main and Pearce St. Clint and Clares restaurant. Ordered your banana book. Can’t wait to go down memory lane. Possibly, Barb. We were on Brownell between Lindsey and Davol Streets. Hope you like the book!